Here’s how to find us….. The Old Dairy, Bunkers Hill Farm, Moulton Road, Pitsford, Northants, NN69BB. Turn off the A508 into Pitsford Village and continue into the village past Pitsford School on your right. When you get to the Griffin Pub, which will be on your right hand side, the turning to the Old Dairy is exactly 1.1 miles from here. Continue out of the village past another set of gates for Pitsford School on your right, and into the countryside. You’ll go past a fishing lake on your right and then there’s a sharp left hand bend. You’ll see a stone wall on your left and post and rail fencing on your right, just before you need to turn right into our drive. If you get to Spectacle Lane on your right or Moulton College Gate 4 on your left you’ve gone too far! There are 2 large boulders marking the drive and a sign set back on the fence saying “Bunkers Hill Farm, Private Road”. Follow the drive down between the avenues of trees. Go past the left hand turning to The Old Cart Barn, as you approach 2 semi-detached houses on the right, turn left through the 5 bar gate to The Old Dairy and park anywhere on the drive. At the roundabout, turn off the A43 towards Moulton Village on the Overstone Road. When you come to the one- way system, head straight over onto the High Street. The road forks in two and you’ll see the Co-Op on your right, take the left hand folk in the road past the little Post Office and Post Box on your right. At the mini roundabout turn right down Cross Street. You’ll go past the Poplars Hotel on your left and through several traffic calming systems. Cross Street turns into West Street, and just after the Telegraph Pub on your right, the road turns sharply to the right (if you turned left it would take you to Boughton) and you’re now on the Pitsford Road. Follow the road out of Moulton Village and you’ll go past Gate 2, 3 and 4 of Moulton College (all on your right hand side). On your left you’ll see 2 semi detached cottages and then Spectacle Lane. After the next field, turn left into our drive. There are 2 large boulders marking the drive and a sign set back on the fence saying “Bunkers Hill Farm, Private Road”. Follow the drive down between the avenues of trees. Go past the left hand turning to The Old Cart Barn, as you approach 2 semi-detached houses on the right turn left through a 5 bar gate to The Old Dairy and park anywhere on the drive. 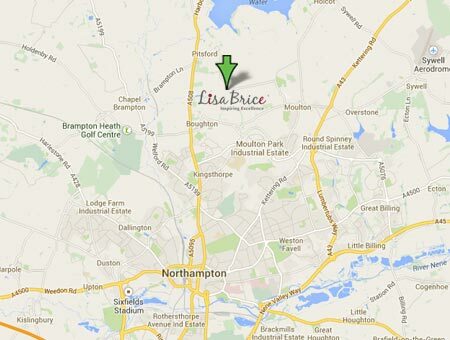 Our closest railway station is Northampton, which is 8 miles away from our venue. There are plenty of taxis at the station and the journey will take approximately 20 minutes depending on traffic and cost around £15.00.